This is a separate thread for the watch party project (feel free to rename it lol) we've been discussing in the main thread. 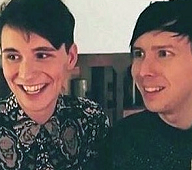 The idea is that we gather, watch D&P videos together and discuss them here on IDB. It might grow into something that involves the whole Phandom, but the first step is here on IDB. This means we won't be making any tumblr/twitter posts but we can use a twitter hashtag if you want. I think it'd be best to keep the majority of discussion here on IDB though! This is long but it's a compilation of a lot of posts. We set a day when we will watch videos. We can set 2-3 hours when we will start them so that everyone can join regardless of time zone. If someone can't make it, they can just watch during that day and come discuss. We make a list of videos to watch. We'll then vote and decide what we're watching! I think 1-3 videos is good? Once we've decided on the day and the videos, we create a thread for that particular watch party and begin our discussion there on that day. For the next watch parties we can try to branch out – make posts on social media and share them, tell friends, try to make this a big project and get the boys more views. Does this sound good to everyone? I compiled this from the main thread, but if you feel something should be different please say so! Theme for the first watch party? 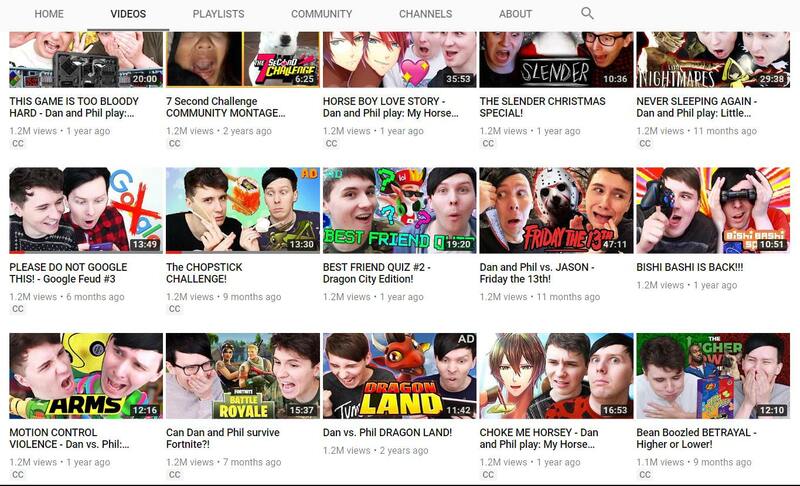 @ame suggested gaming videos, and a pinof theme leading up to pinof 10, there was also the suggestion to watch videos that have little views by @opendoor and @knq, spooky videos suggested by @bookfiend, Halloween baking vids by @kavat, Phil videos suggested by @Fazbaz, and we have talked about honoring Phanniversary with some special viewing that we will share with the phandom at large - vote here or write below if it's not listed! Once we decided on a theme, we'll start voting on videos from that theme! That said, please discuss and let's get this going! I'm thinking about how we can make the above part work best. Watching multiple videos seems like the most fun because then we could have a playlist of the watch party on the IDB channel. And their videos are short enough that watching like 7 minutes of content probably wouldn't be satisfying. Maybe some sort of staggered thing would work, where we plan to watch them an hour or so apart? I'm thinking that if we watch 3 and we post all 3 at the beginning of the thread, we won't be able to make quick comments. It's easier to say something about "2:15" than it is to say something about "2:15 in the pinof 6 bloopers" and that might divide the conversation. I miss livejournal's threaded discussion. seeing as "low views" and "1 of each channel" was top 1 and 2 in the polls, i started looking through their videos to see what we can potentially watch. 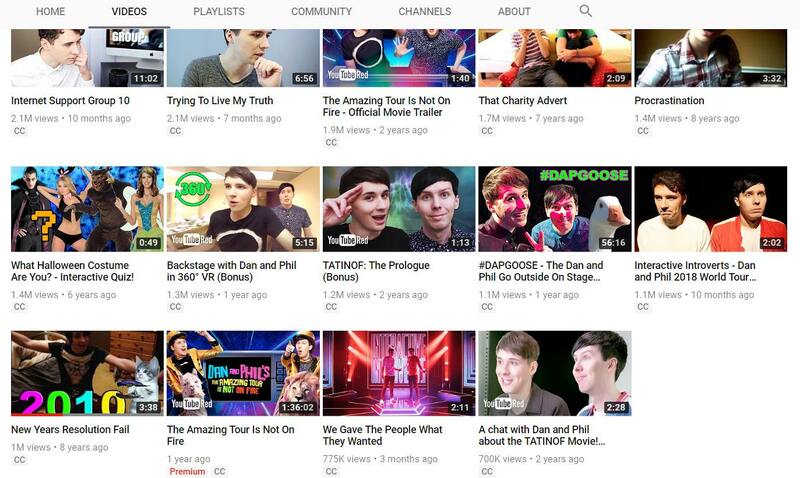 dinof: not counting the tour viddys, one of the lowest viewed are his old videos new years resolution fail(1m), procrastination(1.4m), and that charity advert(1.7m). but trying to live my truth(2.1m) is surprisingly down there. 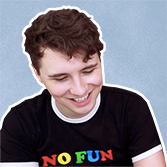 im personally not into watching his old videos simply because im susceptible to cringe but ill be happy reliving dan living his truth. AP: a LOT of oldies to choose from. his adventure viddys are really fun and interesting but can take such a long time if were doing it as part of three videos to watch. maybe it can be its own separate event? personally, phillippa(615k) is......something. if were looking at slightly more recent, yet low view count videos, then drawing my viewers challenge(647k) and reacting to deleted videos(824k) are a few suggestions. dapg: most of these are spon videos but i personally liked the best friend quiz(1.2m) simply because of the question and answer portion. i dont have much suggestions besides that since im pretty ok with any. I don't think staggering would be good because then suddenly instead of committing for one time you need to be free at three different times and people would drop off/miss it, but I appreciate the problem of not having time to discuss if we're all watching three vids. Hmm, if we want in-depth discussion and everyone going at the same time 1 video would be best. Maybe 2 could be good. Also I just checked the poll results and so far it's looking like this weekend, and underwatched vids. If that holds true then maybe we can do it Sunday, and vote on the video/s tomorrow. Though since this is the forum-only run, we aren't going to make much impact re: viewcount. Edit: just saw the big post and good I'm in editing window! The really low viewcount vids for DAPG aren't in the screenshot, because when you sort from most to least popular, they only show a certain number of most-popular, and then cut off. They have to be located manually. Most of them are recent though, so not hard to find. I'm not keen on dragon city/monster spons, cause they're a bit of a chore to sit through imo and we want it to be fun, but some spons are good vids. Maybe we could watch 2 videos - one older and one more recent, so we could write about the differences between them and what has changed. I find that stuff very fascinating to discuss, so that could be an idea? I would like us to eventually expand beyond just our circle here, and maybe then we will have to be more strict on the hours so that we can watch something more. But for now, we're just going to test and see what we come up with. I still hope that most of us will watch at the same time (we'll set times for like, 3 groups from different time zones?). Okay, the poll tells us most people want to go this weekend. This leaves us very short on time to set this all up. If we don't get it going properly, we have next weekend for a bigger "IDB trial" too We can try getting some more people in for next weekend, and I'd say 20-21 is close to the phanniversary so we should try to expand by then since people will be interested. For themes the clear winner is videos with little views. @ame, thanks for your excellent suggestions! My suggestion is - let's pick a recent video of theirs that has little views, and maybe an older one to compare (if we're going with that). Please list videos you'd like to watch and I'll make a poll later. also, if the watch parties work and are officially a go and all, i DEMAND a special watch party for the mark of oxin! I was thinking we shouldn't do any of the really low view videos because we could save them for when there's more people. Tetris and Zelda are ones I'd really like to do at some point. I've just gone for DAPG atm as well. I was thinking The Jumpscare Showdown, because that's a lot of fun and spoooky themed. Or maybe Geometry Dash, or Arms was a good suggestion. Hmm for timezones I've had a look and I think we can cover the world in 2. It's up to us when those two times are though. I put in a bunch of locations from around the world and found that 3pm BST (England) is a pretty good time because it works for Britain obvi, but also US, South Africa, Mexico, India, Hong Kong, and it's only midnight for East Coast Australia, which is pretty reasonable. I think it's not great for all of the US though because some places it's like Early Morning. So then we could have a second time for the people that time doesn't work for. Or we could do completely different, I saw that 5pm BST was good for a lot of places though not Australia and neighbours. Can you tell I'm putting off starting an assignment lol. Thanks for the suggestions everyone! It seems like DAPG-low views is the theme and I'm totally okay with that. Anyone else wants to add something before I make the poll? Also, are we agreeing to watch 2 videos and discuss the differences, or are we sticking to one? @opendoor thanks so much for the time zone ideas! I wonder how many people from which time zone we are going to have. I think anything before noon is a bit too early for most people on a Sunday, but correct me if I'm wrong. Okay, how about we do this: two gathering times for this one, if there are too many people left out (you can still watch in your own time and come discuss), then for the next one we'll do three gathering times? One could be 2-3 pm BST, one later so that more people from the US can join, say like 6-8 pm BST. What do you think? No, I think that is the format we're using! So we'll have the thread open and everyone that wants to can watch it in their own time. I just think it'd just be nice if some of us watch at the same time, so there's an active discussion going on. Does anyone know how youtube counts views these days? I used to know but I've moved away from being as much of a kpop fan as I used to be so I'm not up on the rules. I know that last time I checked rewatching a video didn't necessarily help the views so is there something we should be doing when we have the watch party to make sure we are making a difference? Yay this is coming together people. I reckon 2 vids- I think the comparison could be a starting point for discussion, but not a limiter on what we can talk about. I like the idea of 2 set times, but if you can't make it drop by the thread any time in the 24 hrs. Ok 2pm BST is good for Australia and a bunch of other places, and do we want to say 7pm BST as the other time? I haven't run every place so if that doesn't work for anyone's timezone speak now! @Amiaw I'm pretty sure rewatches count. It wouldn't make sense for rewatches not to count-for youtube its all about ad revenue, and you still see ads on your second, third, fourth watch. Also some music videos literally have billions of views, and that just wouldn't happen unless rewatches were counted. I have been told by multiple people that rewatching a video from the same signed in account does not count as an extra view. Youtube is pretty shady about algorithms but it still might be best if people either sign out of youtube or open it in an incognito window for a rewatch view to count. Multiple views definitely count, as long as you don't loop video and there's been enough time between each view (some people talk weeks, not just horus or days). Going incognito can sometimes have the opposite result since Youtube is trying to eliminate bots and views that aren't "real". There's a vieweing window where the same user isn't counted towards ads, that is usually a 30 days window, but even then is not as clear. There's nothing in the Youtube guidelines or help center that says multiple views are not counted. CLICK HERE to vote for which newer video to watch, and CLICK HERE to vote for the older video! Also, is everyone okay with these gathering times then? Sunday 7th October, 2 PM BST so that people from Australia can still join in, then 8 PM BST for Europe/US? The thread will be open throughout the day so we can chat all day anyway. As for the views, I admit I don't really know. We could try to sign out and watch without signing in? Thanks for all your suggestions everyone, I'm happy to see this coming together! Oh my gosh, not counting rewatches for 30 days is unfair! When did they start doing that! Then again I don't have my youtube history turned on, dunno if that would impact. I guess we should all sign out to be safe, though hopefully nobody's seen the vids recently anyway. now that we more or less have some sort of plan for the test viewing, i wanna ask a question. its a purely aesthetic thing but i have a plan and i just wanna ask if were sticking with calling this the "idb watch party" or would you guys rather we call it something else? i think it all depends on whether we want to keep the idb name in there or if we want it to be more neutral like phandom something. i just wanna know what you guys think. im thinking ahead for when we start branching out to the rest of the phandom outside of idb. it might be easier if theres some sort of poster thing that people can post everywhere with all the details of the showings. that way it feels more streamlined and credible. people can still make their own posts about it but at least the poster can help act as an attention grabber and eliminate any potential "oops i wrote the wrong date on my post but its actually" because all the info will be right there. Both are good points, a graphic would be good. 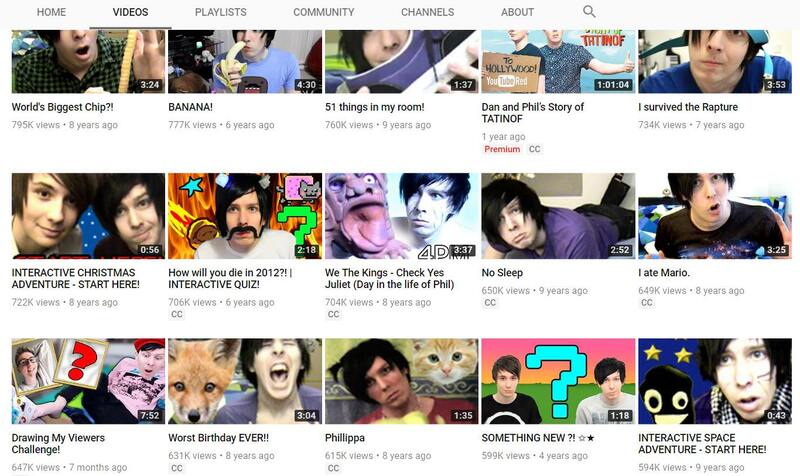 I kinda like 'Phandom watch party' cause it's phandom- organised, and it's like phandom gives which worked really well. Is there anyone here that doesn't like these times: Sunday, 7th October, 2 PM BST and 8 PM BST? 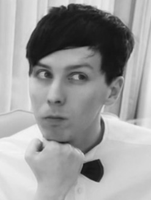 I like Phandom Watch Party, should we just go with that? Any objections? Maybe something else than "watch party" but idk what else to call this? (I definitely want to mention IDB in the poster and all that once we branch out) Should we try to combine Phandom and IDB in the title or would that be too confusing for people once we take this to social media? I've always thought rewatches counted for reasons I wrote above (the only reason I'm not 100% certain is youtube has changed the algorithm a lot and they're not open about it). I know if you press replay that's not a reload so it doesn't count. I've re-read @liola 's post and now I think she was saying the 30 day thing is about ad revenue not displayed viewcount, so if you rewatch in 30 days it still counts. Obvi we want dnp to get ad revenue too though. I still think signing out to be safe could be a good bet, because let's be real none of us are sure, but imo signed in would still count. We definitely want them to get ad revenue. This one is on a small scale, but if we manage to expand it, it could be helpful. I tried googling but I can't find anything in regards to whether signing out would help or not. I guess we could just sign out to be sure? Just adding a vote for Phandom Watch Party too. It's says what it is and it's a party so it's fun A poster would be really cool too. How does the chopstick challenge have low views? Criminal. Amazing we're still in BST, it'll be back to GMT here in a few weeks, but those times sound good.